A powerful storm churned through Northern California Thursday, knocking out power to tens of thousands and delaying commuters while soaking the region with much-needed rain. 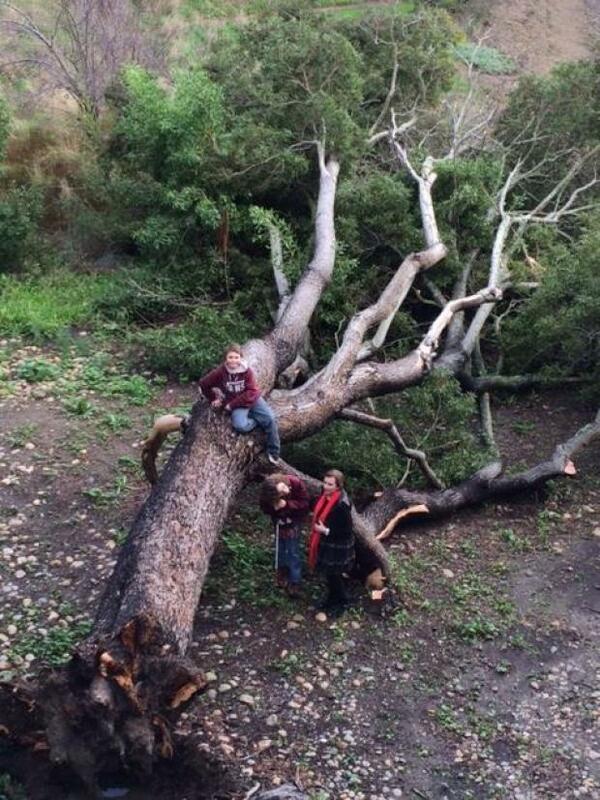 In Santa Cruz, about an hour south of San Francisco, an elementary school student was trapped for about 15 minutes when an 80 foot tree fell on him, pinning his arm and shoulder until rescuers with chain saws cut it apart. He was taken to a hospital in good condition but likely a fractured arm, officials said. Throughout the Bay Area, waves slammed onto waterfronts, ferries were bound to their docks, many schools canceled classes and the gusting winds had motorists tightly gripping their steering wheels on the Golden Gate Bridge, where managers created a buffer zone to prevent head-on collisions by swerving cars. The iconic suspension bridge is engineered to swing in cross winds, and engineers were standing by, but "the concern we have right now is more about vehicles,'' spokeswoman Priya David Clemens said. Pacific Gas & Electric reported more than 80,000 outages due to a single flooded substation in San Francisco, and but blackouts were much more widespread; 226,800 customers were without power. The utility's online map showed lights out over thousands of square miles, from Humboldt near the Oregon border to Big Sur on the Central Coast. "It's a two-pronged punch – it's wind and rain. Once the ground gets saturated and the winds are howling, there's a bigger chance of trees going down on power lines,'' said National Weather Service forecaster Diana Henderson in Monterey. There were multiple accidents on flooded roads and highways, but no initial reports of serious injuries. 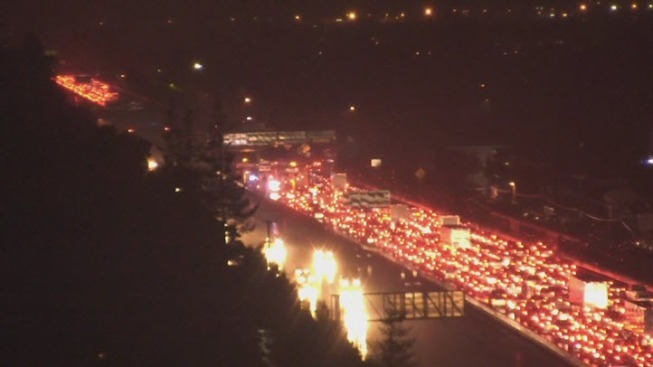 Late Thursday night, Highway 101 in Menlo Park was shut down due to flooding in both directions of the freeway from Marsh Road to Willow Road. The road re-opened just before 6 a.m. on Friday. Earlier in the afternoon, San Jose firefighters reported a partial roof collapse at the Safeway on East Capitol Expressway. A person suffered minor injuries during the collapse, which occurred at the store's produce section. The streets near downtown Healdsburg were about two or three feet under water. At a Safeway grocery store, teenagers drove trucks through a flooded parking lot, trying to make waves for kayakers playing in front of the store. Grocery shoppers, meanwhile, trudged through water to get supplies. A powerful storm churned through the Bay Area Thursday, knocking out power to tens of thousands and delaying commuters while soaking the region with much-needed rain. This "Pineapple Express'' storm blowing southward down the coast was unusual not only for its force, but for its warmth: San Francisco was a balmy 60 degrees, about 5 degrees above average for this time of year, so many people were taking it in stride. Commuters straggled into work. Most trains were delayed on the Bay Area Rapid Transit system, which carries 400,000 riders daily through tunnels under the bay to the region's urban core. Flooding closed the San Bruno station south of San Francisco, and a power outage closed the busy Montgomery station downtown. Some ferry departures were canceled, keeping tourists from visiting Alcatraz Island, but others crossed the San Francisco Bay, despite waves that licked at the rails and rocked boats from side to side. Many flights at San Francisco International Airport were delayed or canceled. Elaine Silver got in with her husband from Canada for a medical conference just ahead of the storm, after a 10-hour layover in Toronto due to snow. Then they woke up without power in their San Francisco hotel. "This is a piece of cake,'' she said, dressed in rain gear as they wandered around the abandoned city. 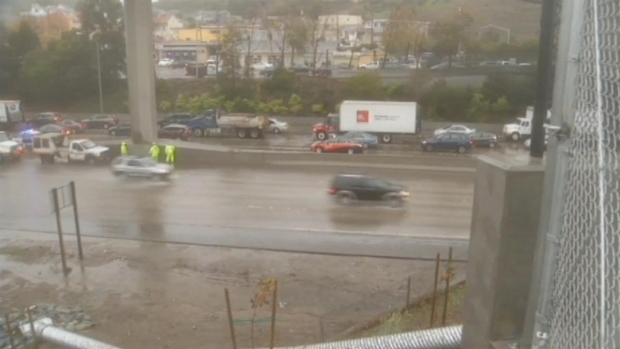 RAW VIDEO: Flooding on Hwy 101 at Oyster Pt. Raw video of storm flooding on Highway 101 near the Oyster Pt. exit. East Coast kids revel in snow days, but closures are rare on the West Coast, so the cancellation of Thursday's classes was a novelty for dozens of schools in San Francisco, Oakland, Berkeley, and Santa Cruz County. Surfers welcomed the forecast of big, choppy waves with swells topping 15 feet, and ski resorts in the northern Sierra Nevada were hoping for more than 2 feet of snow. Still, the storm rattled many people, and forecasters warned the impact could get worse. Mudslides were possible, especially in areas affected by this year's wildfires, and with as much as 8 inches of rain falling, rivers and creeks were rising fast. In California's agricultural heartland, farmers need this good dousing – and many more – to make up for a severe drought caused by three consecutive dry years. This year's above-average rainfall has been welcome, but even this storm alone won't restore reservoirs to normal levels. James McFarlane, a third-generation farmer in Fresno County, said the storm will provide "some Mother Nature-dictated time off out in the field,'' but rain this time of year makes for bigger fruit and better prices. Northern Californians were warned days in advance of the coming storm, and many got ready: By Wednesday night some stores announced they had run out of water, batteries and flashlights, and some cities tweeted that they had no sandbags or sand left. High winds and heavy rains caused flooding and landslides in the Pacific Northwest on Wednesday, and the southward-moving storm was expected to pound parts of Southern California Thursday evening. Riverside County authorities ordered everyone to evacuate an apartment complex in San Jacinto, concerned about potential mud flows. Nevada and Idaho, Arizona and New Mexico could get rain and snow, but nothing like what California is seeing, forecasters said.